The Legend of Zelda Backpack - Moar Stuff - You don't need it but you know you want it. Large Backpack, Size: ~16" x 13" x 5". Ever wonder how the hell Link carries around all that stuff in the Legend of Zelda games? Oh sure, early in the game it’s easy, he usually only has a cheap sword and shield but later on he has a bow and the hook shot and the boomerang, and so on. So, how do you think he carries it all? Well, it turns out, that shield on his back had a backpack under it. 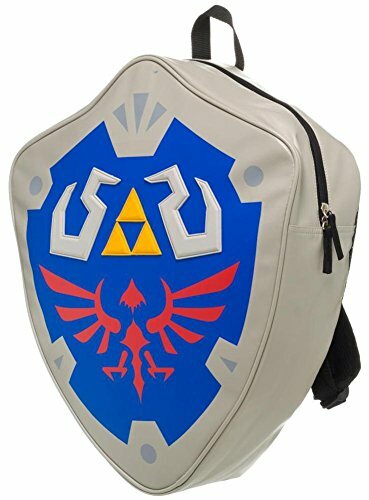 This Legend of Zelda Backpack looks like the Hyrule Shield and can help you carry a bunch of stuff, just like Link. Made from faux leather and offering dimensional details, this backpack is durable and large enough to carry a laptop along with a couple of text books. Be warned, though, the shape is a bit weird since it tapers to a point at the bottom. The Legend of Zelda Backpack comes with a zippered compartment, adjustable straps, and a convenient handle. It’s perfect for carrying around your new Nintendo Switch so you can play Breath of the Wild wherever you go. Size: 24″ x 14″ x 5″.